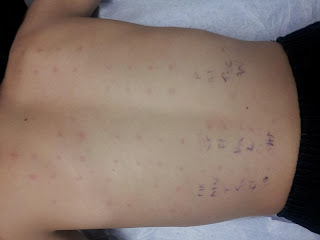 We had our first experience at an allergist this week. We really did not know what to expect. It was no where near as bad as I thought it would be. At first they put put 2 test spots on him so that they would have something to compare the rest with. The one spot reacted and the other did not. The one that reacted itched really bad and the other just turned a little red. After that they tested him with a Normal Kid panel that has the most common allergies. If the spot looks like the test spot that reacted it was positive and if it looked like the one that did not it was considered negative. He actually fell asleep waiting for them to see if they would react. None of them showed an allergy. 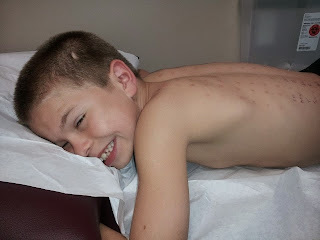 We also had him tested for celiac disease this week which came back Negative. We are very happy for that also.